Sussman Simon 35/1949 Edna Genizda? This montage of eleven individual photos constitutes the committee that arranged the celebration of the 20th Anniversary of this Society founded in New York in 1904 (not the 15th as the photo states). The occasion was a "full dress and civil ball" held on January 3, 1925 in New York City at the Lenox Assembly Rooms, 254-56 Second Street. 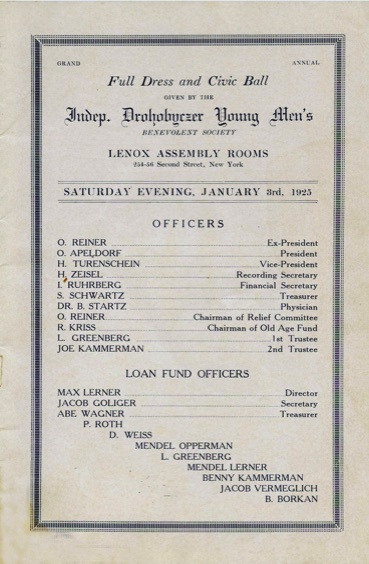 Joe Kamerman portrayed here was the last president of the society. With him are his brother Bernard Kammerman and their first cousin, Max Lerner (about 1892-1951). Hyman Turenshine (1883-1945) was the husband of Max’s first cousin, Kale Lerner. These men and their friends Willie Wagner and his brother Abe were born and grew up in Drohobycz before coming to New York. This list, probably compiled by the secretary of the society in the 1930’s, with some names added later, includes over 200 members. Some listings consist only of a name; some have more information, including age, occupation, address, wife (Almost all the members are men; most women belonged to the women's auxiliary for which there are no surviving records), date of marriage, names of children, length of residence in the U.S.A., and when they joined the organization. Most of the marriages listed occurred in New York, not Europe, so it is difficult to ascertain if the wives were from Drohobycz. Most of these men were born between 1890 and 1910, although some are older. Some members, the sons or sons-in-law of older members, were born in the U.S.A. They joined between 1934 and 1950, the year this list ended.